I just purchased a farmall 'b'. The seat/bracket has been replaced. The serial on the engine block comes back to a 1948 'A'. Is there anywhere else I can find the serial #/year of this tractor? No B FARMALLS were built after AUGUST 1947 and the cast code would be Q for 47. Our B was cast on 7-23-47 and delivered around15th or so in AUGUST. The number with the R1 suffix is a part number, but that 6-22-R looks like a good 1948 date code. According to Guy Fay's "IH Tractor Data Book" there were only 1,921 B's made in '48, and that was the final year for a Farmall B, so yours may or may not be rare, but it is certainly unusual. You are looking at the wrong numbers. Like I said, The suffix R1 and DD numbers are parts numbers, NOT serial numbers. 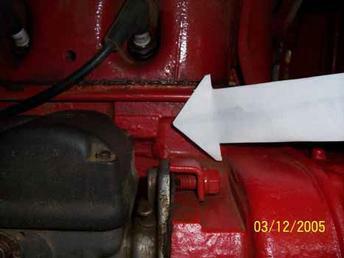 The engine serial number on a Farmall B is stamped on a raised boss on the right side of the block, below # 1 sparkplug. If the block is original, it is close to, but not exactly the tractor serial number. A, B, BN, & AV serial numbers were intermixed, so your engine number may be correct for a late '47 B. There is no other place to find the actual, original tractor serial number. If you closely look over the major castings, such as the torque tube or transmission you will find numbers cast into them such as 9*25*L. The * will look like a screw head. That is a date code that can tell you when the bigger pieces were cast, giving you and approximate assembly date. If you find one post it and someone on here will look up the year code for you. If the number you find ends in R1, R2, or D, or DA. they are not the numbers you are looking for. use the cast codes, they are on the block and other large cast pieces. Example if its a 48 then it would have mainly "R" cast numbers. example 3-20-R that would be that part was cast on march 20th of 48. and S would 49 and Q would be 47 so you can go from there to determine the age, or if you have a mutt tractor.